All meals onboard the Vasco da Gama, FREE afternoon tea and late night snacks, Captain’s Cocktail Party (selected sailings), self service tea and coffee, FREE big show entertainment, cabarets and classical interludes, a range of FREE daytime activities and leisure facilities, FREE guest speaker and arts & crafts (selected sailings), FREE porterage of luggage to your cabin, Cabin Steward service, FREE flexible dining at the Waterfront Restaurant, Waterfront Mediterranean and Waterfront Eurasia restaurants FREE use of library and card room, FREE use of sports courts and gymnasium, FREE use of spa amenities. The premium Vasco da Gama boasts contemporary stylish facilities throughout this boutique sized ocean liner, with a relaxed classical style of cruising incorporating plenty of activities and a wide range of impressive entertainment options. Enjoy your luxurious cruise through some of the world’s most amazing waters around Australia’s south east from Sydney Harbour to Adelaide. Sail south through the Pacific Ocean, Tasman Sea and Bass Strait with ports of call in northern Tasmania and cosmopolitan Melbourne on beautiful Port Philip Bay. As with all Vasco da Gama cruises, you can choose from a range of optional shore excursions in our ports of call of Burnie & Melbourne, simply explore these beautiful destinations on your own or make use of the Vasco da Gama’s on board facilities and activities admiring the coastal landscapes from the deck. The choice is yours. Today, fly into Sydney, where you will be personally met at the airport by a DISCOVER AUSTRALIA representative and transferred from the airport to spectacular Sydney Harbour. Board the Vasco da Gama and settle into your cabin before exploring the range of on board facilities on this luxurious cruise ship. Head out onto the deck as you set sail, passing beneath the iconic Sydney Harbour Bridge. Meet and Greet Personalised Arrival Transfer, Dinner, Late Night Snacks, Overnight Accommodation on board the Vasco da Gama. The magnificent Pacific Ocean is the largest of the world's oceans covering some 165.25 million square kilometres which covers more than 30% of the earth's surface, this mighty ocean is home to many beautiful atolls and islands, the endless blue expanse of the Pacific Ocean teems with wonderful marine life such as sharks, turtles, corals, whales and dolphins. Cruise the Pacific Ocean as you head South along Australia's Eastern coast. Make use of the multitude of facilities on board the Vasco da Gama or relax and take in breathtaking views of the vast expanse of water. Our Burnie port of call is the gateway to Tasmania’s beautiful and spectacular north, including Cradle Mountain. It is a port city with an industrial past that has reinvented itself as a vibrant and creative city on a beautiful stretch of Tasmania’s North West Coast. Nestled around Emu Bay on Bass Strait, Burnie has been an industrial centre for most of its existence. Since the closure of its paper pulp mill, the city has taken a creative approach to promoting itself and the many makers who call it home. Get an early start to the day and enjoy your breakfast as the Vasco da Gama docks. Make the most of your time in Burnie and enjoy a shore excursion and discover the many beautiful sights of this seaside town. If relaxing poolside is more to your liking, settle in with a good book from the onboard library – the choice is yours. This afternoon, we say goodbye to Burnie and head out across the Bass Strait towards the fashionable city of Melbourne. Breakfast, Lunch, Afternoon Tea, Dinner, Late Night Snacks, Overnight Accommodation on board the Vasco da Gama. Sail into Port Philip Bay to reach our Melbourne port of call, docking in the famous docklands. Stylish, arty Melbourne is both dynamic and cosmopolitan. You have the whole day ahead of you to experience the best that Melbourne has to offer. Make your way into the fast paced Melbourne city with an on-shore excursion. If you prefer a slower place, watch the action and take in the city skyline from a prime spot on the ships extensive deck area. Tonight, as you dine in one of the many onboard restaurants, you farewell Melbourne as you set sail towards your final port of call – Adelaide. Continue cruising toward Adelaide while enjoying the on board entertainment and day time activities of the Vasco da Gama. The ships attentive staff will ensure your every need is taken care of on this voyage to Adelaide. With an abundance of onboard leisure facilities, you are spoiled for choice – enjoy a show, learn arts and crafts, curl up with a good book or burn some energy on the sports courts – it’s your choice. Adelaide is the vibrant capital city of South Australia, Adelaide’s city centre is home to beautiful historic buildings, parklands, wide streets and cafes and restaurants, the city combines sensational cuisine, art, shopping and cultural opportunities, Adelaide is the gateway to the world-renowned Barossa and McLaren Vale wine regions and the beautiful Adelaide Hills. 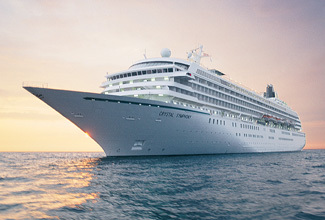 Arrive in Adelaide this morning and after disembarking the Vasco da Gama and saying goodbye to your newly made friends, be personally met at the Adelaide Passenger Terminal by a DISCOVER AUSTRALIA representative and transferred from the port to your Adelaide hotel where you will stay overnight. Today, explore Adelaide at your own pace. Meet and Greet Personalised Port Transfer, Overnight Adelaide Accommodation. Your friendly driver will pick you up in the comfortable air-conditioned coach before sharing experiences, fascinating facts and enchanting stories in the onboard full commentary throughout the morning. Today see Victoria Square (heart of Adelaide City), Gouger Street (restaurant cafe strip), King William Street's famous boulevard, The Terraces (4 terraces that separate the city from its greenbelts) and Adelaide's magnificent parks, gardens and greenbelts. See River Torrens with its delightful garden banks, Parliament House, State Library, Trinity Church (Adelaide's oldest church), fashionable Hutt Street and stop at Haigh's Chocolates to enjoy complimentary tea or coffee accompanied by fine Haigh's chocolates (Haigh's unavailable on Sundays). See Beehive Corner at Rundle Mall, Adelaide Oval (one of Australia's most notable cricket grounds and houses the Bradman collection), the quaint suburbs of North Adelaide; O'Connell Street (restaurants and trendy shops), St Peter's Cathedral, Colonel Light's Lookout on Montefiore Hill (spectacular views over Adelaide). Enjoy some free-time this afternoon to explore Adelaide and some of it treasures. Coach Tour with Hotel Pick Ups, Tea, Haigh's Chocolates, Overnight Accommodation. The beautiful city of Adelaide offers a seductive mix of sensational food and wine with fantastic cultural, art and shopping opportunities, the city is the gateway to some of Australia's premier wine regions and the vibrant city centre is abuzz with lively cafes, bars and restaurants, historic buildings, wide streets and manicured parklands add to the city's wonderful aesthetic appearance. Spend the day exploring Adelaide at your own leisure. Your journey from Adelaide to Sydney encapsulates some of the most striking scenery Australia has to offer, the ever changing landscape outside your window is breathtaking in sheer beauty and size, Adelaide's colonial elegance is left behind as you pass unique landscapes including the majestic Blue Mountains as you travel in comfort toward Sydney. Today you will be personally met at your hotel by a DISCOVER AUSTRALIA representative and transferred to the Indian Pacific railway station to begin your journey to Sydney. Settle in to your cabin before heading to the Outback Explorer Lounge to meet fellow travellers. Enjoy sumptuous meals in the Queen Adelaide Restaurant throughout your journey and exclusive off-train experiences. When you arrive into Sydney you can feel the rush and hustle-bustle of this major cosmopolitan global city. You will be personally met at the Indian Pacific railway station by a DISCOVER AUSTRALIA representative and transferred to Sydney Airport for your final flight home as your epic cruise and train adventure draws to a close. Meet and Greet Personalised departure Rail Transfer, 1 Night Gold Service Cabin on the Indian Pacific (2 Nights Adelaide to Perth), 1 Breakfast, 2 Lunches, 1 Dinner, Luxury Broken Hill Coach Tour (Adelaide to Sydney customers only), Meet and Greet Personalised Rail Transfer. For customers travelling from Perth, the package is 14 days in duration, travelling Adelaide to Perth on the Indian Pacific and staying 2 nights longer in Adelaide. Relax in your private cabin on board the Vasco da Gama while you sail the Pacific Ocean and enjoy FREE full board cuisine with a selection of international cuisine, afternoon teas and late night snacks, self-service tea and coffee and Captain’s Cocktail Party (selected sailings). Experience FREE big show entertainment, cabarets and classical interludes, a range of FREE daytime activities and leisure facilities. Choose from a range of FREE daytime activities, leisure facilities, FREE guest speaker and arts & crafts (selected sailings) and use of the onboard library and card room. Enjoy FREE use of sports courts and gymnasium, FREE use of spa amenities. Enjoy meals and FREE flexible dining at the Waterfront Restaurant, Waterfront Mediterranean and Waterfront Eurasia restaurants. Your package includes an inner cabin but can be upgraded to a range of cabins. Upgrade to a Superior Twin Inner: Upgrade to a Superior Twin Inner cabin and benefit from a cabin on the higher Atlantic Deck. See Upgrade Options below for details. Upgrade to an Ocean View Cabin: Enjoy rich ocean views and a converted double bed in cabins located in the forward and aft areas of the Baltic Deck and the higher Atlantic Deck. See Upgrade Options below for details. Upgrade to a Standard Plus Twin Ocean View: These ocean view cabins are located on the Baltic deck and feature a converted double bed which converts to a sofa for daytime use. See Upgrade Options below for details. Upgrade to a Premium Suite Ocean View: Benefit from the space of a larger cabin (twice the size of the standard cabins). Premium suites are located on the Atlantic Deck and offer stylish interior design, double beds, a sitting area and floor-to-ceiling windows. See Upgrade Options below for details. You will be personally met by a DISCOVER AUSTRALIA representative and transferred from Sydney airport to White Bay Cruise Terminal to begin your journey to Adelaide. On arrival in Adelaide you will be transferred from the Vasco da Gama to your Adelaide hotel. You will be met at your hotel by a DISCOVER AUSTRALIA representative and transferred from your hotel to the Indian Pacific and from the Indian Pacific in Sydney to the Sydney airport for your flight home. The Vasco Da Gama boasts stylish cabins and impressive contemporary public areas, with a choice of five lounge bars, a pool bar and four entertainment venues each with its own individual style. She offers a casino, library, card room and shopping galleria plus extensive deck areas, two swimming pools, sports courts, spa amenities and a gym. Experience top ‘big show’ entertainment in the two-tiered show lounge Hollywood’s. Enjoy the panoramic seascapes of The Dome during the day, then this is the place to be to dance the night away to all your old favourites. Relax with some musical entertainment at the Blue Room. For more leisurely options, stroll around extensive deck areas, catch a movie in the cinema, visit the casino, bridge and card room, arts and crafts area or ship’s library. Plus, there’s Cappuccino’s coffee shop and Gelato’s ice cream bar to tempt you. The impressive three-decked atrium is the focal point of the ship with it’s own shopping galleria. Be pampered at the well-appointed wellness centre, make use of the hairdressing and beauty facilities, or work out in the well-equipped gym. Daily organised activities can range from arts and crafts to guest speakers. Check the daily activity list on board for all the options. Many passengers kick off the evening with a pre-dinner drink at one of the ship’s several bars before making their way to dinner. Enjoy flexible dining at your leisure at any of the three main restaurants Waterfront Restaurant, Waterfront Mediterranean or Waterfront Eurasia. Perhaps indulge at The Grill or Chef’s Table; or relax at the buffet style Club Bistro. Vasco Da Gama’s chefs excel in creating new and delicious dishes which will have you craving your next meal. A selection of Australian and European wines are available to complement your meal plus Australian draught beers are available at the ship’s bars. You will savour every day on board the Vasco Da Gama. 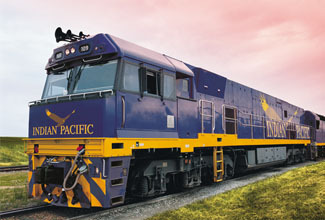 The Sydney to Adelaide Vasco da Gama Cruise with Indian Pacific is very popular. Many dates book out well in advance, please book soon.